In this section we’ll cover the most popular ad types used for selling Teespring products on Facebook. We’ll share general tips and recommendations for each ad type, but keep in mind there are tons of tutorials and guides available online and everyone has their own opinion on the effectiveness of each ad. Generally, sellers start with a $5 – $10 budget and then make a data based decision after 24 – 48 hours of running their ads. Opinions vary based on ideal target audience sizes and the ad type you select, but narrowing your target audience to 50,000 – 400,000 people is a good range to start with. Before launching your first ad, be sure to read up on Ad Placements to ensure you’re getting the most conversions for your ad spend. Campaign: This is the parent group. We recommend one Facebook ad campaign per Teespring listing. For example you will create a PPE campaign and all ads/ad sets under this campaign will have “engagement” as their main goal. Ad Set: You can have many ad sets within a campaign, each with its own budget. We recommend using multiple ad sets to separate your various targeting strategies. For example, one ad set might use interest targeting, while another might target based on field of study. Ads: You can have multiple ads within a single ad set. We recommend keeping your targeting the same for all of the ads within a set, but varying the creatives to test effectiveness. Facebook will automatically try to determine which ad image or copy is the most effective. TIP: Check out this video on setting up your first Facebook ad! There are three types of Facebook ads sellers commonly use to sell, we’ll discuss these in more detail below. PPE ads could be considered the easiest ads to set up. You can either promote a photo or a link within the post – keep in mind visual posts (with photos) are more eye-catching and will be more effective for generating engagement. The aim of this ad is to encourage engagement (i.e. shares, likes, clicks, comments), page likes to generate organic traffic to your listing page through this engagement. 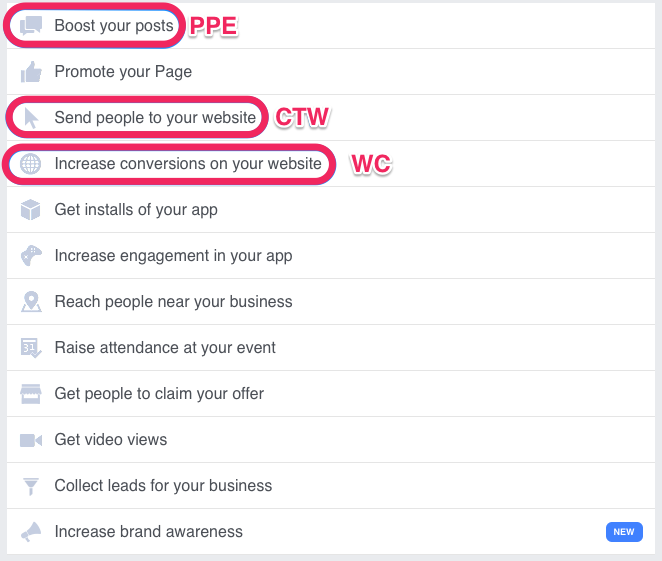 Facebook tends to serve this ad type to people who regularly engage with posts (i.e. who like, share and comment frequently). PPE ads involve an extra step for potential buyers because clicking a PPE ads does not send a person directly to your listing page. If someone clicks on this ad, they will be taken to an enlarged image of the ad within Facebook. This means there is an extra step for potential buyer because they need to specifically click on the campaign URL (which you can include in the ad text or in the comment section of the post). The aim of CTW ad is to generate URL clicks and send as many people as possible to your listing page. Less steps for buyers; if a potential buyer clicks on the ad, she/he will be taken directly to your Teespring listing page. This is the most “advanced” of the three ad types. CW ads require the use of a tracking pixel and aim to create and target your ideal buyer audience based on the people who convert on your ad, i.e. purchase from your campaign. Facebook uses the insight it gains from your buyers and adapts your target audience as the ad runs.